This superb restoration by Bolenbach Engineering cost almost $17,000. 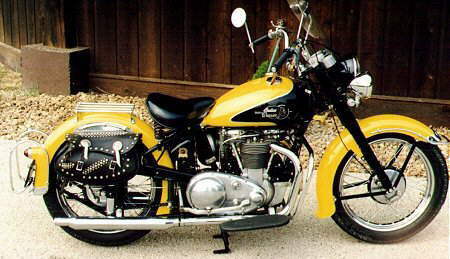 Students of the Indian marque will tell you that the Warrior was the most robust example of the vertical twin line built by Indian from 1948 to 1953.
bar, windshield, luggage rack and even a set of the 1952 police running boards. This bike has been featured in numerous magazine articles and is possibly the finest vertical twin Indian in existence. More information at the Allen Museum.